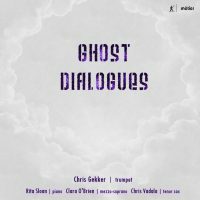 Equinox Sonata (2015) for trumpet and piano was written for and is dedicated to Chris Gekker. The work was commissioned with support from the University of Maryland. At the two yearly equinoxes, the plane of the earth’s equator passes the center of the sun, and day and night are equal. “Sun Horizon” is bright and energetic, cast in a loose sonata form. “Dream Walking” is dedicated in memory of composer Brian Fennelly (1937–2015). The tone is lyric and elegiac—building to several climaxes before ending quietly. “Moon Mysteries” begins with a machine-like ostinato and a modal melody. The (nervous) energy does not abate as the music presses towards a vigorous conclusion.